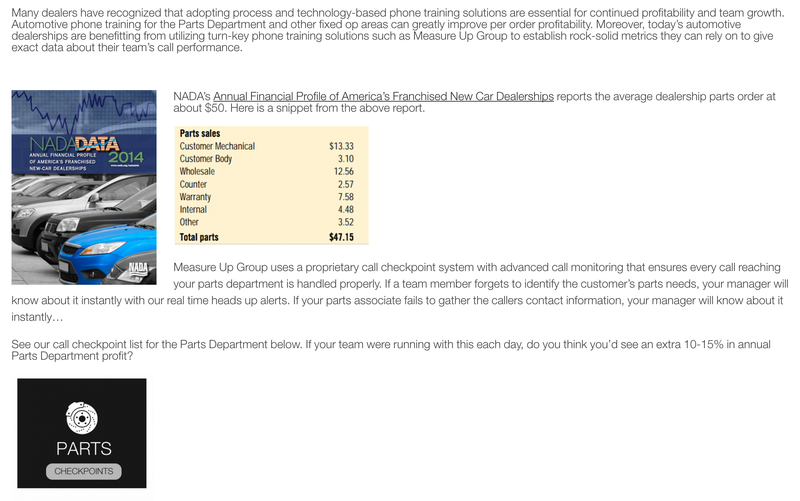 Measure Up Group’s social insight sharing about automotive Internet phone training for increasing dealership sales and ROI. Measure Up Group believes that experience, process, and technology can work together to benefit today’s car dealer in setting more appointments, converting more online leads, and measuring ongoing improvement. For nearly forty years we have developed data-supported results improvement processes that are designed for improving your dealership’s sales, service, parts, and body shop phone training, monitoring, analyzing, grading, and reporting processes. All backed by a state of the art digital platform that you can access anytime, anywhere. We show you how to capture more sales & profits from the calls you are already generating. Below you will find some fast and helpful resources and social insight sharing about Internet phone training for increasing automotive dealers sales and ROI. Join us on Google+ for insight, tips, and tools to help improve your incoming call handling performance. Using social networks to provide useful and relevant information to our customers, industry, and every car guy and dealer who wants to improve their phone skills and process. We analyze your team’s call handling performance and identify problem areas & individuals. Our Twitter feed is full of techniques and exact processes you can implement now for increasing dealership sales and ROI in your store! Follow us here. On Measure Up Group’s Pinterest Boards you can find exact solutions for handling incoming dealership calls for Sales, Service, Parts, and Body shop. Follow Measure Up Group’s board Automotive Dealership Phone Call Analysis Tools on Pinterest. We rate your team’s performance; provide clear reports and effective training to improve it. Instagram is a fun social image platform to share great pictures, cool graphics, and quick data. We like to provide easy to use phone sales training hacks, that are common sense and help you get results. Follow us here! 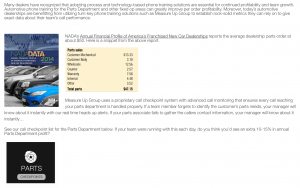 Read and Share our previous article, “Automotive phone training for the parts department”.